Biogas plant pumps are what drives the Anaerobic Digestion Process in all biogas plants. They are literally the heart of the process. If a biogas plant pump stops working and there is no standby pump, the process will no longer be fed and a biogas production slowdown will start. Soon, if pumping is not resumed, the plant will shut-down and vital revenue from the products the plant produces, especially the biogas production, will be lost. AD Plant down-time is extremely expensive, and also highly damaging to the service that the biogas business is contracted to provide for its customers. It hardly needs to be stressed here, how important it is that the pumping equipment is of the highest order of reliability, and many would advise that only a specialist pump supplier to the AD industry, with a strong reputation for reliability, can provide the AD plant operator with that level of service. The content of this page is summaried in the video below, so you can now find out about Biogas Plant Pumps, by watching our video! In this article we provide a case study of how specialist pump contractor Verder Liquids/ Verder UK provided the biogas plant pumps for a food waste AD Plant at a brewery in Norfolk. Anaerobic digestion provides renewable energy. This is achieved when organic matter is transformed to biogas, in the absence of air. Verderflex HUS Screw-channel pumps have proven to be excellent pumps for anaerobic digestion. Read here about two examples: “Recovery of waste food” and “production of biogas”. A prestigious brewery based in Norfolk, who produce fine quality real ales have installed an anaerobic digestion (AD) facility. It is used for producing biogas to be inputted into the national gas grid. The anaerobic digestion facility is fed with kerbside-collected food waste, food processing waste, supermarket food waste and brewery waste. The organic matter is entered into a feed inlet at the start of the process where a rotor chopper breaks down the raw material. Verderflex pumps move the chopped slurry from holding tanks and through a heat exchanger to raise the temperature prior to entering the main AD facility. As the hot organic material enters the main AD facility it is dosed reliably and accurately by a Verderflex Dura pump with an inorganic pH buffer to accelerate and maximize the breakdown of the material. The large mass of organic material is ‘churned’ by Verderflex pumps in a plant room connected through a series of pipes to maximize the surface area and further accelerate the AD process and obtain the greatest yield of heat and biogas. The heat is recycled back into the heat exchanger. Upon completion of the AD process, the digestate and waste water is pumped from the tank by a Verderflex pump for further use as fertilizer. The final product of biogas is then filtered and processed further ready to be inputted into the national gas grid. Enzyme dosing and other chemical dosing solutions. 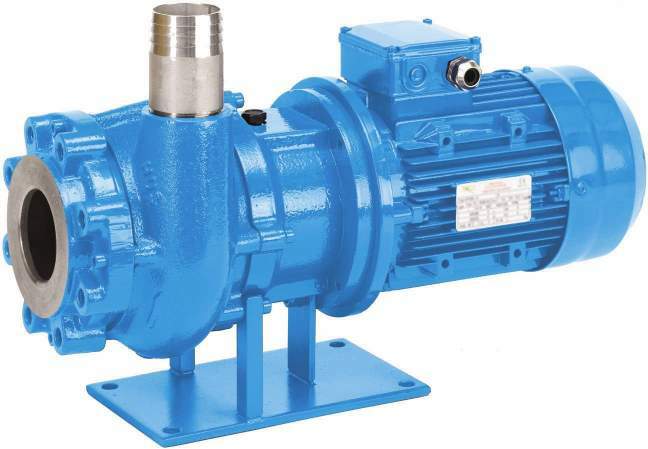 Because of their construction HUS screw channel pumps are excellent pumps for use as Biogas Plant Pumps, pumping waste with large solids such as bones. The percentage of solid matter can sometimes increase up to 10-13 %. For a.o. the pumping of fish waste (fish morts) to produce biogas a Verderpro pump is being used with a real “green”development.